Mild and moderate cases of acne may clear up without scarring but more severe cases can cause permanent tissue damage. (Ref. 1) Some people are left with deep craters or depressions in the skin, called atrophic scars, that occur due to a loss of tissue. People with darker skin, including African Americans, tend to develop raised scars or keloids. Mild to moderate craters can be treated with chemicals, lasers and abrasion to resurface the skin. More severe scars may require one of several types of surgery to improve the appearance of the skin. Home remedies are not recommended. 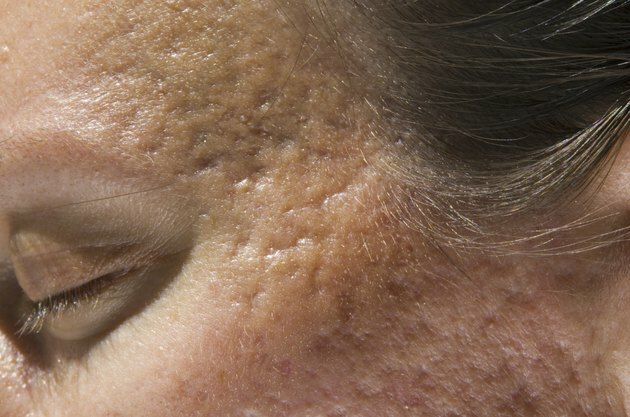 Two types of dermabrasion are available for the resurfacing of skin affected by atrophic scars. Microdermabrasion, the less invasive form, is a form of exfoliation that removes the outermost layer of the epidermis painlessly and without side effects. Dermabrasion, which must be done under general or local anesthesia, removes the epidermis layer and is more effective with deep craters. (Ref 2, 4) Both procedures are performed with specialized equipment in the dermatologist's office. Step By Step Treatment of Acne Scars; Niti Khunger, M.D.